In the US we don’t own the trade name for Forever New so we call it Fashion Care. Our US customers can trust that they are getting the same great formula that Canadians have been using for 25 years. Specially formulated to bring out the best in fine fabrics, whether you hand or machine wash. Fashion Care can be used to wash all delicates and fabrics: lingerie & hosiery, silk, wool, cotton, swimwear and lycra. A large bottle is good for at least 125 hand washes or 32 regular machine washes. Fashon Care Fine Fabric Wash is specially formulated to bring out the best in fine fabrics, whether you hand or machine wash. Fashion Care can be used to wash all delicates and fabrics: lingerie & hosiery, silk, wool, cotton, swimwear and lycra. A small bottle is good for at least 25 hand washes or 6 regular machine washes. Fashion Care Fine Fabric Wash is specially formulated to bring out the best in fine fabrics, whether you hand or machine wash. Fashion Care can be used to wash all delicates and fabrics: lingerie & hosiery, silk, wool, cotton, swimwear and lycra. 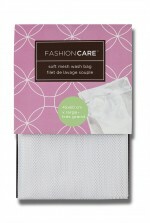 Try a sample size of Fashion Care on your next load of laundry! 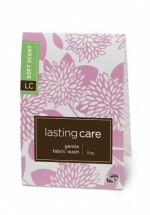 Fashion Care Fine Fabric Wash is now available in liquid! Perfect for High Efficiency machines, Forever New can be used to wash all delicates and fabrics: lingerie & hosiery, silk, wool, cotton, swimwear and lycra. Made with plant based, biodegradable cleansers; free of SLES, parabens, phthalates and dyes; and never tested on animals. That's a promise. A small bottle is good for at least 120 hand washes or 30 machine washes. The perfect home for Fashion Care powder. Keep your Fashion Care handy and fresh in this beautiful contemporary tin. Fashion Care’s zippered Mesh Wash Bags enable safe and thorough machine washing of lingerie, hosiery and most other delicate garments. Our unique mesh design allows for maximum water flow and thorough cleaning, without the worry of snags or pulls. The Fashion Care LARGE Bra Bather is ideal for D+ Cups. Bothered by stubborn deoderant marks? Buff them away. Ideal to keep in your purse and office desk, this "go to" sponge ensures clothes are always at their freshest.